"New Friends" - Legend of Korra. A poster from the 2012 San Diego Comic Con.. HD Wallpaper and background images in the Avatar, La Légende de Korra club tagged: the legend of korra new friends the krew korra asami bolin mako tenzin. 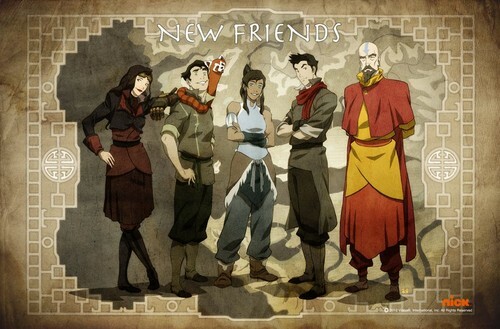 This Avatar, La Légende de Korra photo might contain vitrail, signe, affiche, texte, tableau noir, tableau, and affiches.